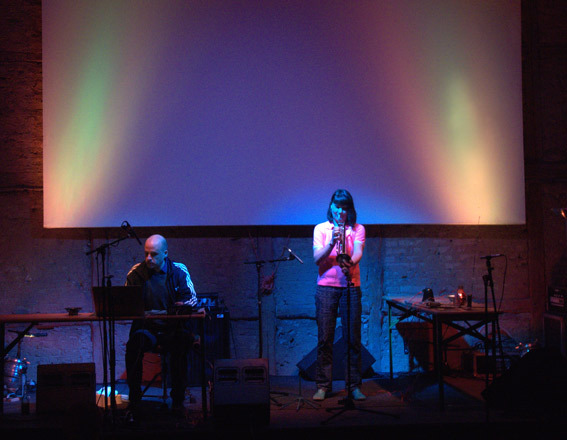 Gregory Büttner plays sounds from a computer through various small external speakers, which Birgit Ulher uses as mutes for her trumpet. This way the trumpet sounds and the electroacoustic sounds are modulated by the acoustic resonance chamber of the trumpet. The trumpet functions here simultaneously as transmitter and a receiver. The duo is based in Hamburg. Since 2008 they played several concerts in Germany and Europe, at Ahornfelder Festival in Leipzig, Avantgarde Festival Schiphorst, Ny Musikk in Bergen (Norway), Fylkingen in Stockholm, Festival klub katarakt in Hamburg, blurred edges Festival in Hamburg, in Prague (together with Pražsky´ Improvizacní Orchestr), the Prinzhorn Sammlung in Heidelberg, Kassel, Stuttgart, Wiesbaden, Karlsruhe amongst others. Their first release Tehricks, a mini cd with 3 tracks was published by 1000füssler in 2010 and the full length CD Araripepipra was published by the London based label Hideous Replica in August 2014. „Tehricks is nineteen minutes in total length and features a nicely balanced, not too gabby, not too spacious set of three improvisations recorded in early 2009. Brian Olewnick, Just outside, April 05, 2010. Gregory Büttner plays his electro acoustic music through various external loudspeakers. At the same time these sounds are modulated by resonance chambers (everyday objects like plastic cups) and vibrating objects, which are placed on the speakers. Birgit Ulher uses extended speakers, fed with radio noise in her trumpet mutes. The trumpet functions as an acoustic chamber and modulates the radio noise, thus the trumpet is transmitter and receiver at the same time. She also uses metal sheets as vibrating objects. By varying the pressure on the metal sheets, which are held against the trumpet bell, she creates multiphonics and splitting sounds.